This is no normal guacamole! 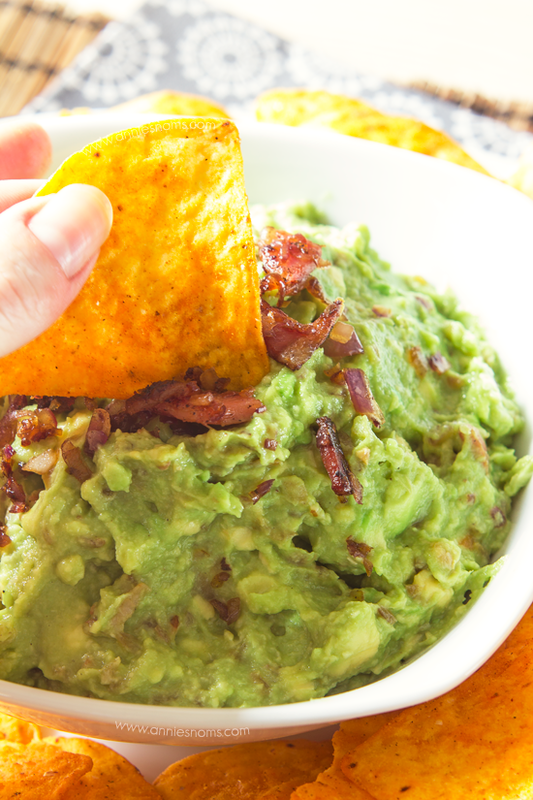 This mind-blowing homemade guacamole has roasted garlic, bacon and fried onions in! Served with tortilla chips, this will be one appetizer you won’t want to share! How are we half way through September already?! 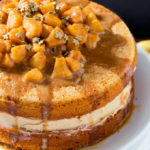 However, there is one good thing about it being the third week of the month – it’s Secret Recipe Club reveal day! This month I was assigned Desiree’s blog Steak N Potatoes Kinda Gurl. Heading straight on over to her About me page I found that Desiree is currently studying for her Master’s degree in community counselling. A Master’s?! Congrats! I take my hat off to you – I only managed a normal degree and that was bad enough – I missed my kitchen too much! 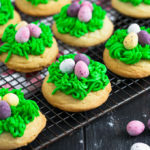 She’s also engaged to her high school sweetheart, PJ – I’m a sucker for a cute love story and have been lucky enough to find my one and only first time round just after I left school, so I love when I hear about other people who have been together since then – kind of gives you faith in mankind! There were so many fabulous things to choose from, I found myself drawn to the Cheesy BBQ Sloppy Joes, Nacho Chicken Bake, White Chicken Enchiladas and these Southwest Chicken Burritos – basically lots of Mexican goodness – I’ll definitely be heading back over to get the recipes for them all, our dinner rota needs some changing up! 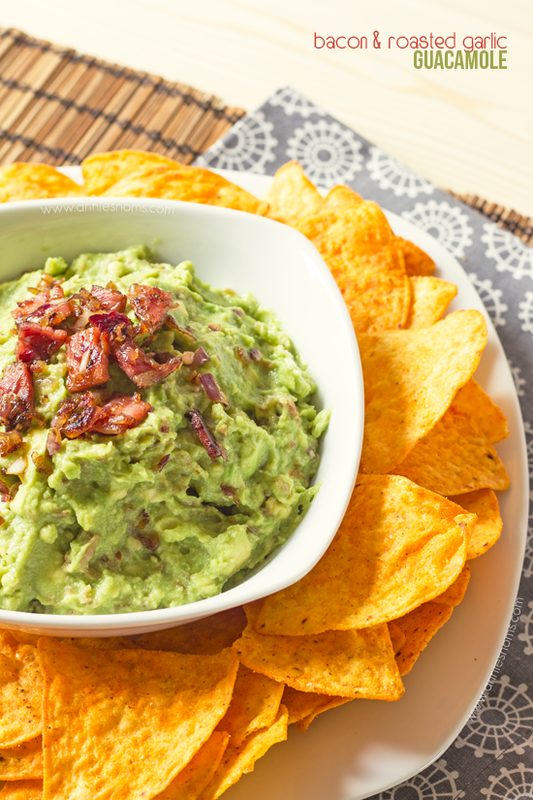 Eventually I decided on this Bacon and Roasted Garlic Guacamole. I’m always searching for the perfect guac recipe and you guys – this is definitely it. I left the cilantro (coriander) out as I’m not overly keen, but obviously you can put it right in if you like it – it would add another dimension to this already wonderful guacamole. 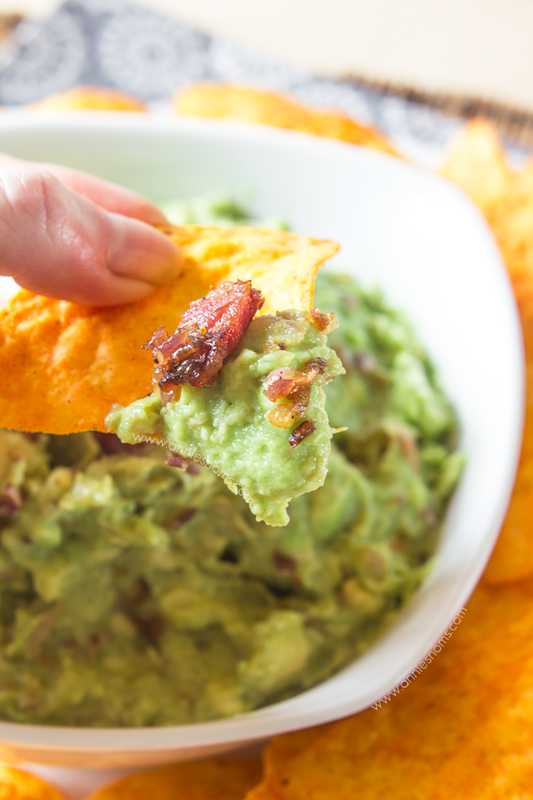 I honestly feel like I no longer need to look for a go-to guac recipe because this one is just perfect, you get the soft, creamy avocados, just a hint of garlic and crispy pieces of bacon – I used some for garnish to make the photos look good – but let me tell you, there is plenty of bacon in the guacamole too! Just look! ^^ I’m in love… we polished this whole bowl off in under 10 minutes. I could hardly photograph it quickly enough!! My boyfriend was almost itching to come over and dip his finger in and as soon as he heard the camera go off he was like “gimme!”. 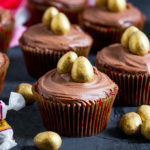 You need to go and make this now and then lock yourself in a room with a big bag of chips and not share it with anyone – food bloggers curse is that the only window in my house is in the lounge therefore, my OH had already seen it before I could hide away with it hahaha!! This is no normal guacamole! 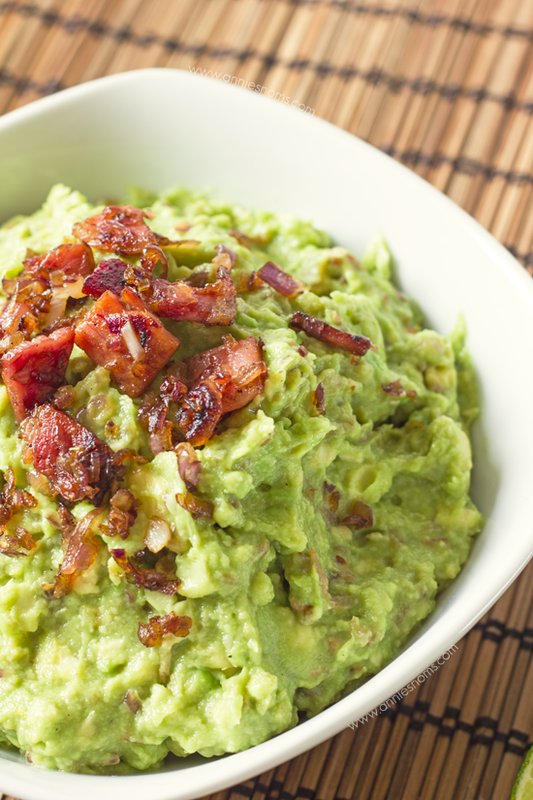 This mind-blowing homemade guacamole has roasted garlic, bacon and fried onions in! Served with tortilla chips, this will be one appetizer you won't want to share! Preheat oven to 200C/400F. Slice the head off of the garlic and squash slightly to try and open the cloves. Drizzle with a little olive oil and sprinkle with salt and pepper. Wrap in tin foil and place in the oven for 25-30 minutes, until lightly brown and cloves are soft if you squeeze slightly. Whilst garlic is in the oven, chop the bacon into 1/2 inch pieces and place in a frying pan over a medium heat, cook until crisp. When the bacon is almost ready, add in the diced onion and fry until translucent and browned. Transfer to a plate covered in kitchen roll to drain. Leave to one side with the finished roasted garlic. Scrape out the avocados and place in a medium sized bowl, season with salt and cayenne pepper and squeeze in lime juice. Mash with a fork until mostly smooth, some bigger lumps are fine. Squeeze the garlic cloves out of their casings and chop roughly. Stir in the drained bacon and onion, chopped garlic and then add in coriander if using. 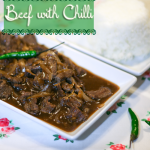 Recipe from Steak N Potatoes Kinda Gurl *I left out the cilantro (coriander) as I'm not overly keen, you can of course add it in! Good Morning Annie, I do enjoy avocado and I love guacamole. I love the fact that the garlic has been roasted in the oven as the garlic will have such a wonderful, mellow flavour…. not too powerful. 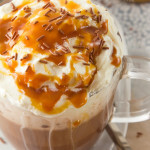 I am certainly going to be making this recipe. My husband would love this dip! It sounds and looks right up his alley! 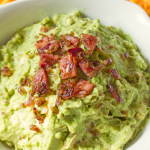 great SRC choice, Bacon Guac is my favorite! Oh my gosh! 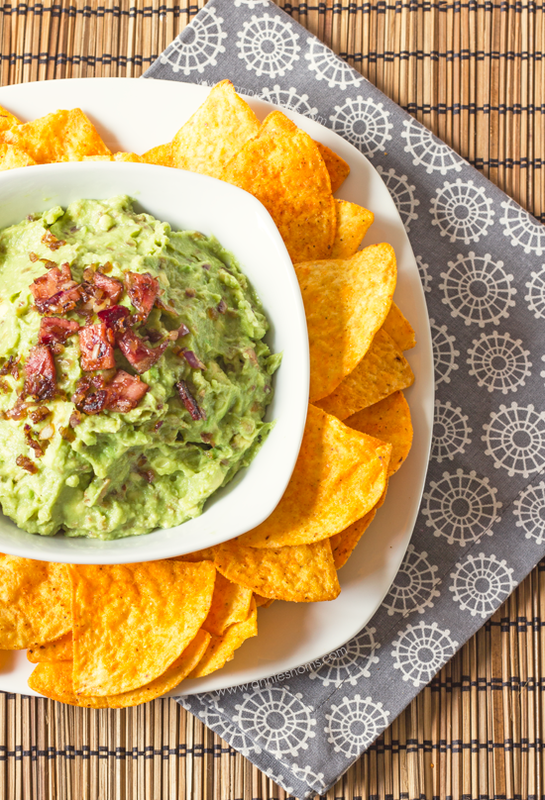 If there was any way to make guacamole better than it already is, this is it! This sounds amazing and addicting! ooooh what an awesome version of guac! i love it! NOT an avocado van, but this looks great. I wasn’t too keen until recently, but this has made me fall in love with it! I am so particular about my Guac, but this looks like a version I would love!! Can’t wait to try for my next party! I love Mexican fiestas! I’m totally the same, I’ve been known to buy 3 or 4 different ones at the supermarket to try and see which one I like, but now I think I’ll just stick to homemade!! OMG….I need this in my face right now. 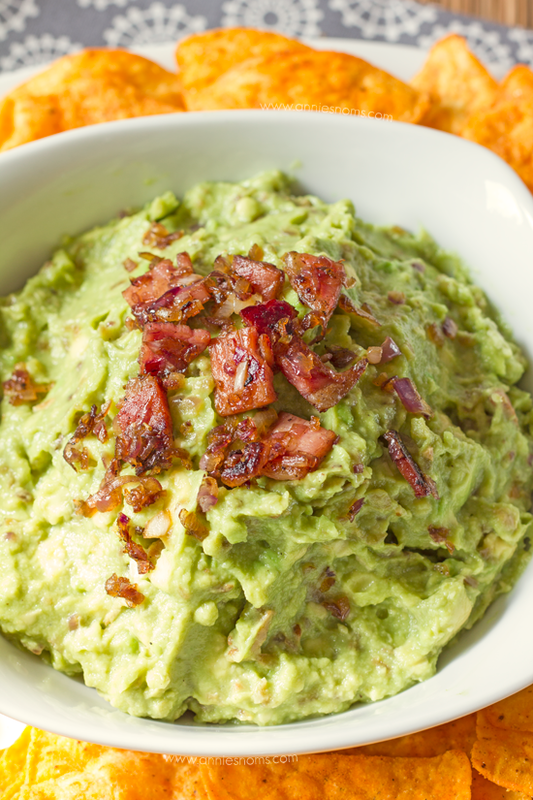 I love the addition of bacon to your awesome Guacamole! 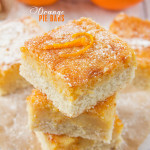 Hope you are having a great weekend and thanks so much for sharing with Full Plate Thursday. Bacon and avocado, Sold! 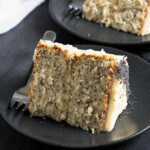 I’m thrilled you stopped by and shared at Foodie Fridays. It was fun to share. I am looking forward to seeing what fabulous post you have to share this week. Party starts Thursday at 9 pm EST. Hope to see you there. Stopping by to say hello and let you know I have featured your Guacamole on Foodie Fridays this week. Hope to see you there! I’m sorry I’m so late commenting, life has been super crazy! So glad you liked the guac, I haven’t made it in awhile I’m now I’m knowing I need to really soon. Love me some bacon and roasted garlic. Love your photos so much!